Students have room to be creative while still being guided toward certain educational goals. You can use projects to teach and prepare lessons between classes. Students can complete projects and peer-review other entries without your intervention. 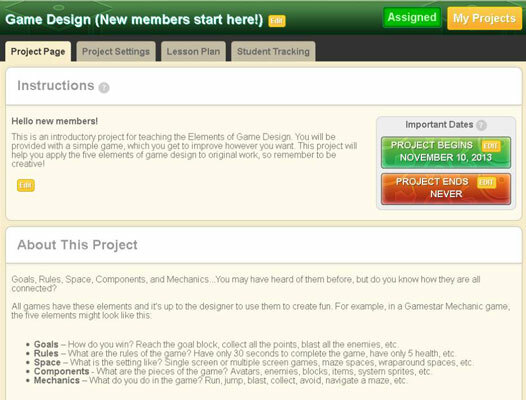 Click the Class Projects button in the Classes section of your workshop. The My Projects page appears. Click the orange Add New Project button. This button appears below the list of your active projects. Clicking the button opens the Project Catalog page. The Project Catalog page displays a number of project templates, each with a lesson plan and a template for students to design entries. Find a project that looks interesting; click the View button underneath a project to see details about it. Clicking the View button lets you see what these projects can do for your class. Every project has a few paragraphs detailing its motive and summary. You may want to start with projects that support a fundamental level of understanding, such as the Elements of Game Design project or the Easy-Hard-Balanced Game project. You can also use the Make Your Own Project option to create one from scratch, giving your students an expansive template and inventing the rubric yourself. (Optional) After you find a template you want to use, click the orange Lesson Plan button to view a general lesson plan for the project. Although this step is optional, it’s a helpful way to understand how you can use the selected project well. The lesson plan includes notes about the project, suggestions for questions to ask your class, and an outline of a lesson plan that includes discussion, playing, and designing. Click the Preview & Assign button next to the Lesson Plan button. The project page appears, where you can start designing your project. After you select a project, you see the page where you set it up. Title: The title of the project is displayed at the top of the page, next to the Edit button. Use the button to change the title, if you want. Instructions: The instructions for the project aren’t supplied by the site, but rather by you. Click the orange Edit button, and in the box that appears, write a message to your students, explaining how they should complete the project. Important Dates: The Important Dates box, which appears to the right of the instructions, contains a date on which the project starts and a date when it ends. You can edit both dates by clicking the orange Edit button. If you edit the Project Ends date, you can use the Never button to keep the project running unless you close it manually. Remember to click the orange Save button. About This Project: This project overview is provided to your students and cannot be edited. Project Goals: This text, which cannot be edited, tells your students what they should be thinking about and what the project is trying to teach them. 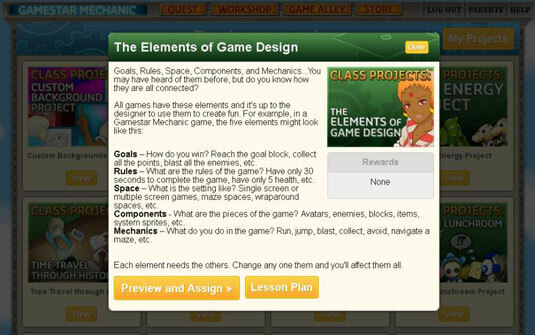 Project Games: These games teach the concepts of the project. You can try playing the games to see what exactly your students will experience. Allow Draft Submissions: If you select Yes, students’ draft games count as submitted. The students can still work on the games, but others in the class can see each draft as it’s saved. Allow Late Submissions: If you select Yes, students can submit games — or edit their submissions — even after the due date has passed. Message Students When Project Begins: If you select Yes, you send a reminder to every student’s Messages box whenever the Project Begins date passes. Receive a Message Whenever a Student Submits a Project: This option can notify you when students submit entries to this project. Remind Students Before Project Is Due: If you select Yes, enter a number in the next box, next to your options. If the project is about to end in the selected number of days, your students receive a message reminding them to complete the project. Project visibility: This option determines the parameters for when students can view each other’s entries. The Never Show Entries option doesn’t let them do so, whereas the Always Show Entries option does. The Show Entries after Project Due Date option makes students’ submissions invisible to classmates until the due date passes. Remember to click the orange Save Settings button at the bottom of the page. In Step 3, assigning the project, you can select the group of students to whom you want to assign the project. The Add Students box allows you to select a number of students. After selecting the students you want, click the orange Assign Project button to give them the project. You can also assign the project to teachers with a similar box, labeled Add Teachers, allowing teachers to provide their own entries among the students’. As you add people to the project, their usernames appear in the Assigned Students box. After you have assigned the project to whomever you want to receive it, you have successfully completed the creation process.